For the last year, Spectral Labs has been working on a program based on the RAILS platform for National Institute of Environmental Health Sciences (NIEHS). The program developed specific training designed to meet the mandates of 29 CFR 1910.120 for HAZWOPER training required for workers accessing Superfund sites and other employees who are exposed to hazardous substances through the clean-up, treatment, storage, and disposal of hazardous waste, directly tackling the goals of the NIEHS Hazardous Waste Worker Training Program. Spectral Labs Talks RAILS on The Haz Mat Guys Podcast! Check out the Haz Mat Guys Podcast for concise, easy-to-understand information on all aspects of Hazardous Materials response, including free resources like RAILS! Spectral Labs has started the New Year by moving to a new location, owing to growth in our number of employees, as well as new programs requiring additional manufacturing and lab space. At the World Trade Drive location, Spectral Labs grew from a 7 person company in 2010, to 18 employees in 2015. Neighboring the HP facility along Bernardo Center Drive, the new facility is just 2.5 miles away from the previous facility, and nearly double the size at 6500 sq. ft. This has already allowed us to bring on 2 new employees. Things are busy around here at Spectral Labs, and we look forward to a great 2016, doing much more work for the Federal Government, in addition to continuing our ongoing mission to provide State and Local agencies with the tools they need to be effective in radiation detection and adjudication. Spectral Labs – ISO 9001:2008 Registered Company! On October 15 and 16, 2015, Perry Johnson Registrars completed the accessment audit of Spectral Labs Quality Management System and presented SLI with a Certificate of Registration. Spectral Labs is very proud to have successfully completed the ISO 9001:2008 assessment audit. The certificate of registration expires September 2018. Spectral Labs is proud to announce that the RadMATE Smartphone Reachback service is now available for both Android and iOS devices. This service is primarily intended for use by Law Enforcement agencies, Hazmat teams, and First Responders that utilize Radioisotope Identifiers as part of their mission. For more information, please check out the RadMATE product page, accessible from our Home Page. This Spectral Labs Incorporated program is for the commercialization of the MultiFunction Wand (MFW) technology developed in a FY10.2 SBIR Phase II program, which will be known as HART going forward.. The MFW full body screening tool will be repackaged into HART, which will be suitable for resolving detections from other systems in a screening environment. The outcome of this program will be six Test Units capable of undergoing government testing in operational environments. The technology is intended to fill a defined TSA need and will have applications in other security screening environments. SLI Has Been Awarded a Phase II SBIR Contract for RadMATE! The risk of an adversary mounting a Radiological or Nuclear (RAD/NUC) attack on the United States remains one of the greatest threats to our Nation. The Domestic Nuclear Detection Office (DNDO) has identified an opportunity for exploiting rapidly emerging Smart Phone technology as one of many tools to counter this threat by giving Law Enforcement Officers (LEOs) and Emergency Responders (ERs) support on their local Smart Phones or Tablets to significantly enhance their ability to properly adjudicate encounters with radiation sources. The classification of RAD/NUC threats is challenging because the terrestrial environment includes significant radiation background. This includes Naturally Occurring Radioactive Material (NORM) and many legal medical and industrial sources. Providing officers and responders with up to date support through an in hand Smart Phone or Tablet will optimize their defensive response throughout the Nation. The Smart Phone support will automate and standardize communications with centralized authorities. The benefits will include minimized burden on operators and eliminating the need for a specialized laptop computer with instrumentspecific Reachback software. SLI’s proposed development of radMATE will combine all of these elements in a powerful software package to provide a user friendly Smart Phone App that is easily adaptive to individual agency requirements. SLI has been awarded a Phase I SBIR Contract for RadMATE! SLI has been awarded a Phase I SBIR contract from DHS DNSO to develop a mobile app that will interface with Radioisotope Identifiers (RIIDs) and allow for the efficient creation of incident reports that can be sent to Reachback experts (e.g. spectroscopists) for additional adjudication assistance. SAN DIEGO, Calif., September 21, 2012 – Spectral Labs Incorporated today announced that it signed a Phase III contract with the Department of Homeland Security’s Domestic Nuclear Detection Office (DHS/DNDO) to support the Test and Evaluation of the Realistic Adaptive Interactive Learning System (RAILS). The award is made under the small business innovative research (SBIR) program funded by the U.S. Government to promote the development of new technology. This is a continuation of work from Spectral Labs’ SBIR Phase I and Phase II contracts. 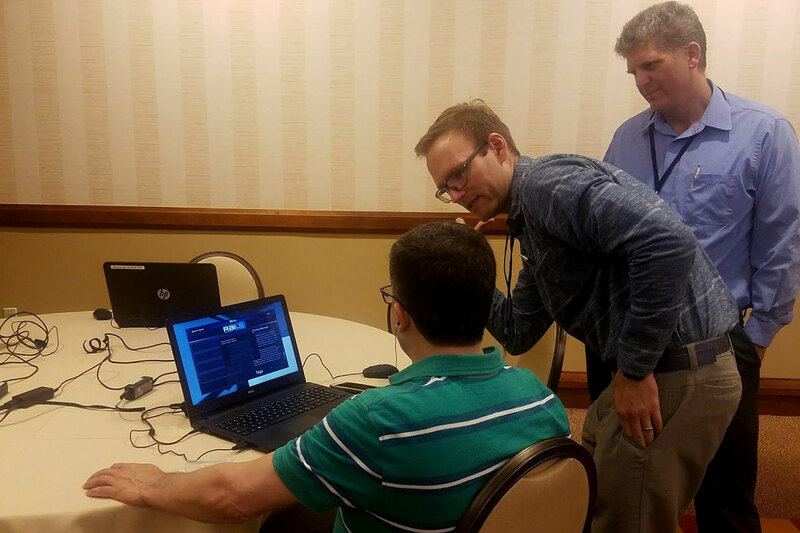 Immersive simulation training with RAILS is applicable currency and refresher practice for those who participated in initial hands-on training with radiation/nuclear detection devices. A variety of agencies also find the realistic virtual training and operational practice valuable to introduce the concepts and equipment to new hires. Providing a set of 3D virtual environments with realistic radiation physics in which radiation detection skills may be practiced, RAILS accurately models the performance of a wide range of radiation/nuclear detection equipment, and enables instructors and administrators to track performance relative to individual training objectives. Mr. James Winso, President of Spectral Labs, stated, “We are pleased to receive this contract award from DHS/DNDO and are excited to offer RAILS as an immersive simulation tool to provide responders with useful, practical training.” The training is an approved course in the FEMA State/Federal Sponsored Course Catalog Course # DHS-018-PREV (https://www.firstrespondertraining.gov/catalog.do?a=state_federal) and available for grant funding.